The clouds are gathering over the city and the raindrops are splatting and splotching over the windows, and I find myself heating up cup after cup of hot cocoa to stave off the gloominess that inevitably accompanies a dark cloudy afternoon. And although chocolatey goodness is all well and good in the chilly afternoons, one can't just live off hot chocolate (can that be the new diet trend please - it might be one I'd actually want to try) and now that it's nighttime by 5pm, dinner seems to call for something hearty and warm, with a good helping of fun as well. Something caramelized and chewy and roasty and toasty. And cheesy of course. Always cheesy. I'd been planning to get together with friends at ABC Kitchen, which got me thinking about their Roasted Kabocha Squash Toast. That was the perfect mix of earthy squash and sweet caramelized onions. So when thinking about something that would fit the bill for a nice homey pizza topping, I decided that would serve as my inspiration. A delicious seasonal squash (doesn't the name "butternut squash" seem to conjure up warmth inside you just upon hearing it?! 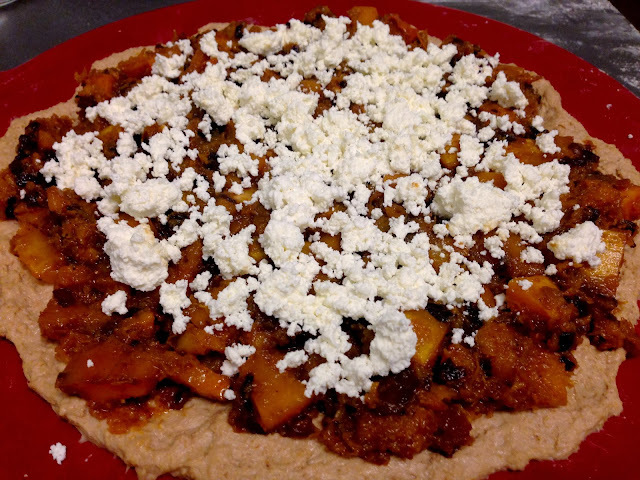 ), a nice caramelized onion (you know I'm a fan of those), and fresh homemade ricotta cheese. Sweeten it up with a dash of balsamic and some apple cider vinegar for an additional layer of flavor, and you've got yourself a pizza for a dark night and good conversation. The squash gets all melty and tender (and a little crisp on the edges for texture), the onion gets kind of jammy with all the delicious sweet vinegar it soaks up, and the ricotta makes it cheesy without weighing it down. Use your dough of choice - we're still making our way through a healthful whole wheat dough, but a regular refined dough will do you one better methinks. In any case, you'll end up with a pizza you devour for dinner and the next day, happily, for lunch. 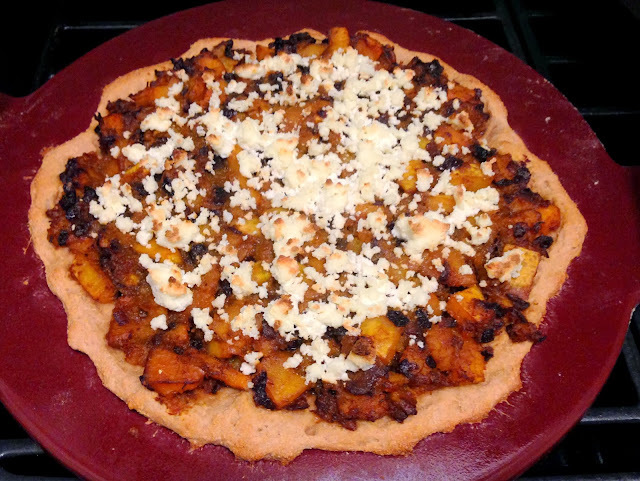 Adapted from Jean-Georges Vongerichten's Squash on Toast and Smitten Kitchen's Roasted Bacon and Butternut Squash Pizza. Peel and dice the squash into 1 inch cubes. 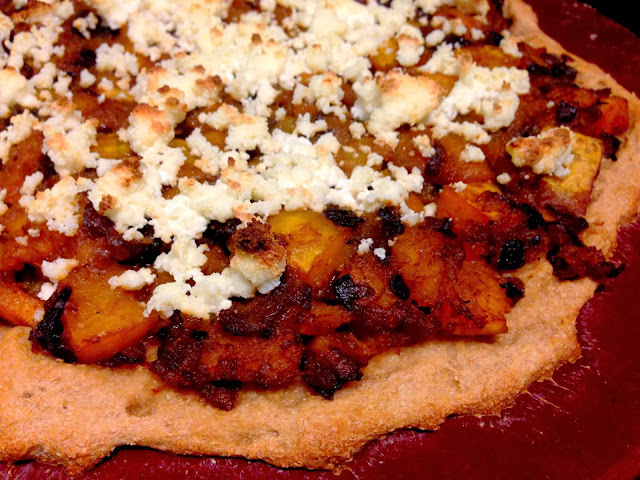 Combine squash with 1/4 cup olive oil, chili powder, 1 tbsp molasses, and salt, and toss well to coat. Spread on a parchment-lined baking sheet and roast, stirring every now and then, for 15 minutes. 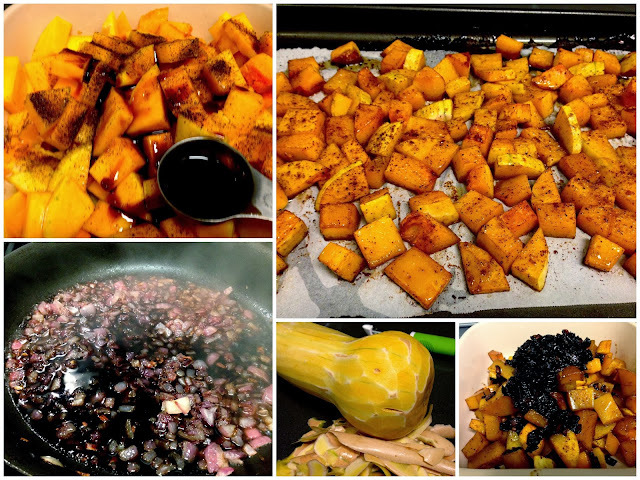 While the butternut squash is cooking, heat 2 tbsp grapeseed oil on medium high, add onions, and cook, stirring frequently, until the onions start getting soft and brown. Sprinkle 1 tsp salt and stir to combine. Add in the vinegars and the rest of the molasses, stir, and reduce, for about 15 minutes. The result should be a nice onion jam. Combine squash and onions in a bowl and mash together (leave some squash chunks, but make sure everything is well mixed in). Sprinkle your pizza stone or baking sheet with flour. 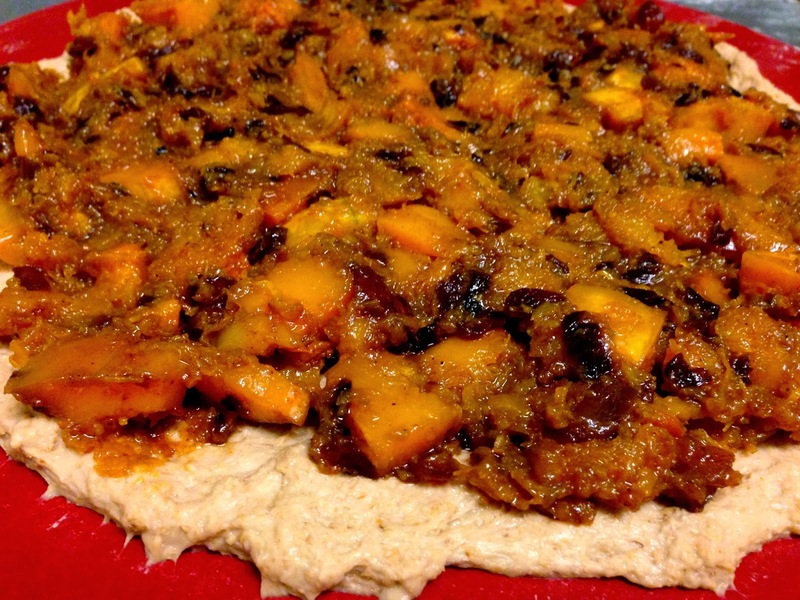 Spread the pizza dough on pizza stone or baking sheet. Spread the butternut squash and onion jam mixture on the dough. Top with fresh ricotta cheese. Bake in the oven for 15-20 minutes or until dough is golden brown. Lightly sprinkle sea salt on top just before serving.